In order to choose the perfect bread maker for you, you only need to know some basic things. Let’s skip on the introduction and let’s talk about these wonderful machines. When talking about the most important tips for choosing a bread maker, it’s better to start with the most helpful components. I’m talking about the accessories that make from each maker a great useful appliance to have in the kitchen. 1 measuring cup for water and flour and seeds. I only use the cup for water measuring. I weigh the flour for increased accuracy. Some machines have a liquid measuring cup and a dry measuring cup, two separate accessories. a user manual that offers users the good stuff: various recipes, like those for white basic, whole wheat, French, and sweet breads, dough recipes, jam, cakes, and so on. The number of recipes depends from machine to machine. Each one is called a cycle. It’s recorded in the makers’ memory under a number. You just select the number corresponding to the desired cycle, press ON, and that’s it. All you have to do after that is wait. Not all machines work the same so I advise you to read the entire user manual before first usage. another cycle is the bake rapid one. I’ve used out of curiosity and it’s very good. However, I’m never in a hurry so I just use the basic cycle. last but not least, there’s also another option common to all bread machines that I end up using quite frequently. It’s the delay timer function. My bread maker has a 13-hour delay timer. It means that I can put all the ingredients in the pan now and have the bread ready in 13 hours from that moment. It’s awesome. If I know that I’m going to need fresh bread in the morning, I just use the delay timer and I have my fresh burning hot loaf at the precise time that I want it. If you really like raisin bread or loaves with nuts and fruits, then an automatic fruit and nut dispenser might be a feature to take into consideration. Breville Custom Loaf is such a bread maker but be prepared to pay a considerable sum for it. If you are on a tighter budget, you can definitely go for a less expensive model. It will beep when it’s time to add those ingredients. On the other hand, Panasonic SD-YD250 has a yeast dispenser, which is not as helpful. I’ve mentioned the kneading blade among common accessories but there are bread makers that have taken it a little further. The kneading blade is essential because it mixes all the ingredients together for making the dough that’s further baked by the bread maker. The idea is that the kneading blade remains in the dough and when you remove the loaf it’s going to have a hole in the middle of the base. That empty space is dealt with by some makers. For example, the Cuisinart CBK-100 beeps when it’s safe for you to remove entirely the kneading blade. Thus the dough it’s baked without that accessory. The Breville Custom Loaf collapses the kneading blade before the baking phase so the hole is considerably smaller. And there also are some Zojirushi bread makers that have two blades for a perfect mixing and rising of the dough. The dual kneading system also makes whole wheat and gluten-free loaves to be beautifully risen. When talking about the most important tips for choosing a bread maker, it’s essential to include the price, as well. For a lot of us, the price is the main factor that influences our final choice. The lowest price is around $50 and that one is an excellent bread maker. The highest price is $300. I’ve reviewed several models, one of the best machines corresponding to all price ranges. And you can get an excellent one for the lowest price and keep it for years and years to come. The higher price brings certain unique features and advantages, obviously. If you just want to make basic white or wheat loaves and dough then a cheap bread maker is perfect. The loaf size is another criteria to consider. There are machines with just one loaf size, the 2 pounds loaf, while there are others with 3 sizes, even with 4 sizes (1 pounds, 1.5 pounds, 2 pounds, and 2.5 pounds). You get to choose from 3 crusts (light, medium, dark) in the case of all makers. And there is also a delay time of 13 hours. You can add the ingredients in the nonstick pan and have the loaf ready in maximum 13 hours. Each model has 10 or 11 or 12 or even 14 preprogrammed cycles. All the recipes that are included by the user manual or recipe booklet are based on these menus. And this is the moment where I offer you one of the most important tips for choosing a bread maker. Not all machines have the gluten-free setting included. If you want this particular menu, make sure that it’s included. As far as I know, the most affordable models to include it are the Oster 2-Pound Expressbake Bread Machine CKSTBRTW20 and the Cuisinart CBK-100. Other than that, expensive models absolutely have the gluten-free option but most of the cheaper or medium-priced ones don’t. Also, another important tip is that there are machines that include the possibility of memorizing your own favorite recipes and, thus, transforming them into cycles. Zojirushi Home Bakery Supreme offers users the liberty of registering their own 3 cycles. Breville Custom Loaf offers even more customization options: 9. Another tip that you might consider is that if you want even more recipes, I recommend getting a bread machine cookbook with hundreds of recipes that work with any brand. When I say time, I mean the time it takes for a maker to complete its cycles. Especially the white basic one. I‘m not only referring to the bake time. That lasts around 1 hour. I’m referring to the whole process. From the moment you press the Start button, when the pan is in with all the ingredients, till the time the beeps are heard, suggesting that the cycle is done, completed. For example, my machine takes 4 hours to complete the white basic cycle. Others take 3 hours. Some manufacturers only mention the bake time. They say that X machine bakes bread in an hour. It’s not a lie but it’s not the whole picture, either. Thus, you should pay attention to this factor, too, even though it’s not the most important tip for choosing a great perfect bread maker for your needs. After all, during that time till a certain cycle is complete, you don’t have to do anything. You just leave the machine alone to do its job, it’s fabulous. Hi! 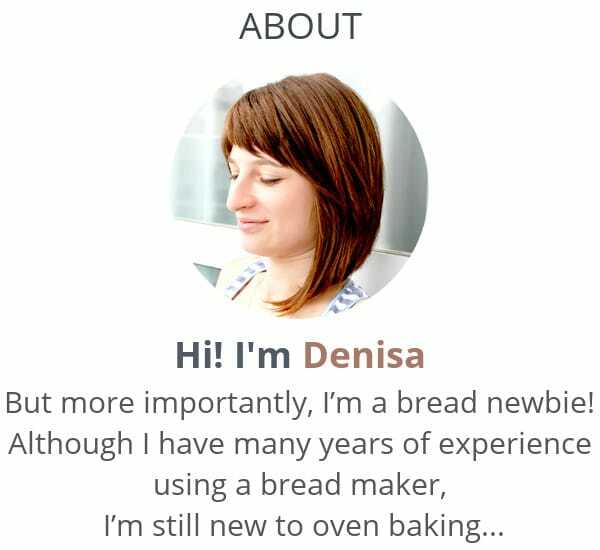 My name is Denisa and I love the taste of homemade bread. My bread maker has become one of favorite kitchen appliances which I use almost daily and that's the reason for making this blog. Olives and Oregano Mini Breads: Unexpected Flavor!